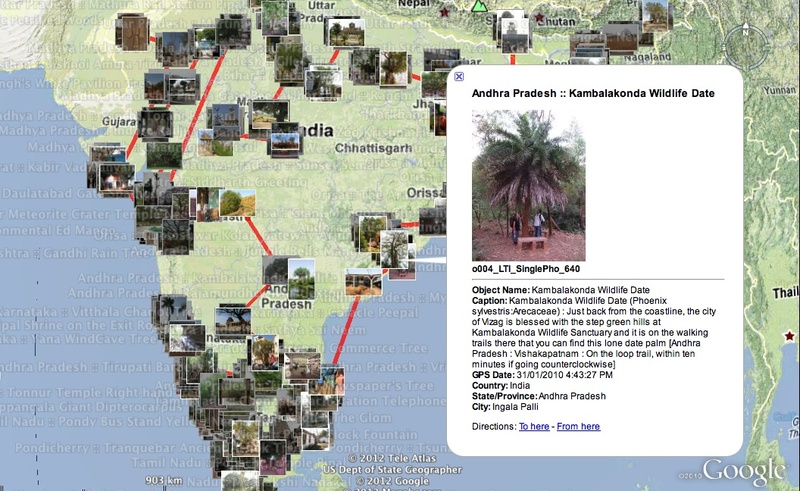 Picasa photopoints: This photo-thumbnailed map was generated using Picasa. Small thumbnail images serve as placemark icons. This file is large (>44mb) and needs to be downloaded to your computer. 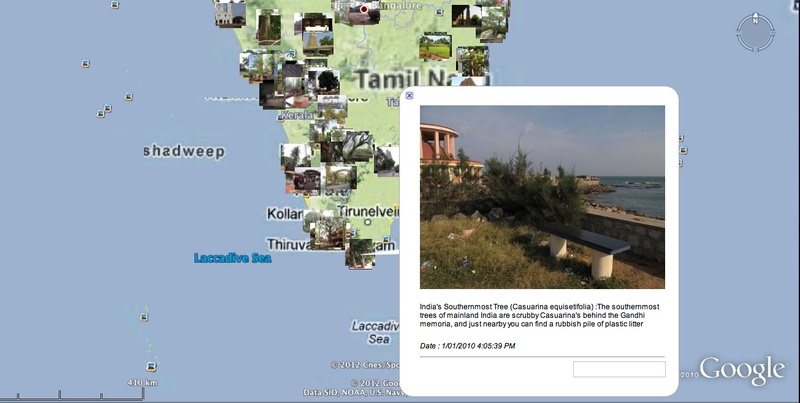 Geosetter photopoints: This map was generated by Geosetter, and features thumbnail icons leading to detailed balloons. A red line marks the journey, from tree to tree. This file is medium size (11mb) and needs to be downloaded to your computer. 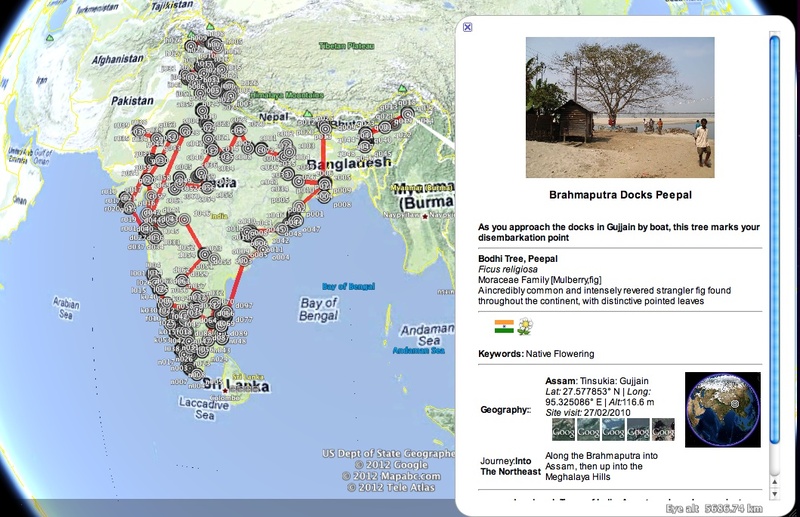 Fusion Tables, with profiles: This map was generated by Google Fusion Tables. Target circles mark the locations of trees, and formatted data is displayed in the popup balloons. This file is small (0.4mb) and can be viewed online. Fusion Tables, concise: This simple map was generated by Google Fusion Tables. Target circles mark the locations of trees, however, there is little data stored in the popup balloons. This file is very small (0.2mb) and can be viewed online. Earthpoint: This map was generated by Earthpoint, and is the base layer used on the Atlas-Ambassadors and Earth pages. The green targets mark the location of trees, and a concise balloon provides links to the most-up-to-date data profiles on this web page. This file is very small (0.2mb), and can be viewed online. BatchGeo: This map was generated by BatchGeo, and is the base layer for the Atlas-Complete. Trees of different priorities- Ambassadors, Diplomats, and Landmarks- are marked in different colours. A simple balloon gives a thumbnail picture and a link to the most-up-to-date data profiles on this web page. This file is small (0.6mb), and can be viewed online.